Energy drink makers would have you believe their products are a healthy rehydration choice for athletes while also giving them keener focus and renewed vitality. But before adding them to your sports regimen, you should also consider what effect these beverages could have on your teeth. Energy drinks are similar in ingredients to sports drinks like Gatorade® and PowerAde®, which mostly consist of water, salts, vitamins, sugars and acids. In addition, energy drinks like Red Bull® and Monster Energy® add caffeine to boost energy. Besides their sugar content, the main threat from a dental health perspective for both of these drinks is their acidity, which can severely erode tooth enamel. The irreplaceable loss of enamel significantly increases your risk of tooth decay and eventually tooth loss. The threat of enamel erosion is especially pronounced whenever the mouth’s pH level falls below 5.5. The acidity of both sports and energy drinks falls well below this mark. In one experimental study samples of enamel exposed to a number of sports drinks lost an average of 1.5% of mineral content over five days; energy drinks more than doubled that loss at 3.1%. Given the potential harm these beverages, especially energy drinks, can cause your teeth, you should exercise caution when consuming them. In fact, our best advice is for you to avoid energy drinks altogether, for your overall health as well as your teeth’s sake. Unless you’re participating in a physically intense sport, water is your best source for hydration after exertion. Â If you do drink sports beverages, try to limit them to meal times when your saliva is most active to neutralize mouth acid. You can also rinse out your mouth with water after drinking to help further reduce mouth acidity. As an athlete, you’ve trained your body to be at its optimum physical peak. 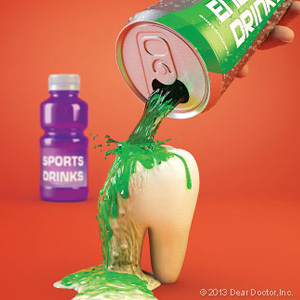 Don’t let energy or sports drinks take the edge off your health, especially your teeth.